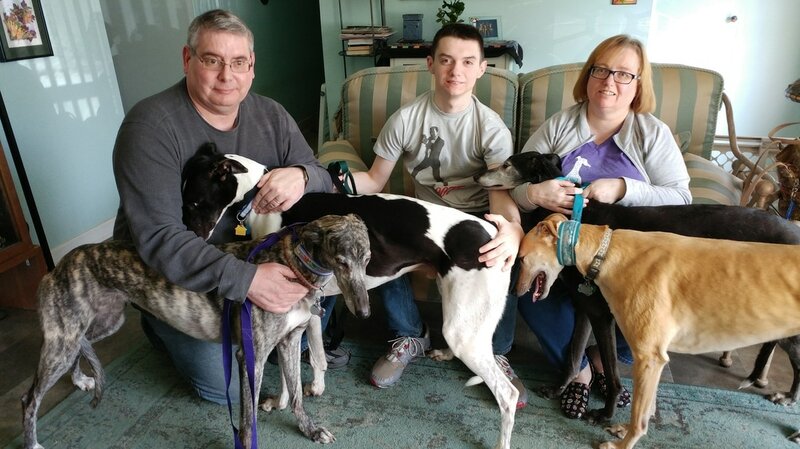 Theresa, John and Ian of Huber Heights love their girls - brindle Daisy, black Sally and red Fawna - but they still missed having a male greyhound after losing Ares a while back. They met white and black Cruisen Chucky, now called Vlad, and a connection was obvious. Just look at Vlad cuddling with John in the photo. Vlad is a boy who needs other dogs around so he'll live happily ever after with his new friends. Theresa reported that he walked into his new home, found the couch right away, and settled in for a nap. Smart boy!